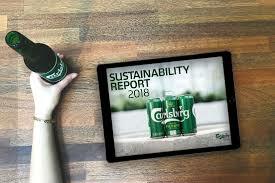 The Carlsberg Group’s 2018 Sustainability Report shows steady progress against the targets set out in its sustainability programme, Together Towards ZERO, in a year focused on bringing sustainable innovations to consumers. Launched in 2017, Together Towards ZERO is rooted in Carlsberg’s purpose and forms a part of the company’s SAIL’22 strategy. It consists of four major ambitions: ZERO carbon footprint, ZERO water waste, ZERO irresponsible drinking and a ZERO accidents culture. The programme was developed in partnership with leadings experts, including the Carbon Trust and WWF, and is aligned with the UN’s Sustainable Development Goals. For 2018, the Carlsberg Group reports steady progress on its sustainability ambitions, during a year in which the Group also presented strong financial results − accelerating top-line growth and improving margins. Since its 2015 baseline, Carlsberg has reduced relative carbon emissions by 20% and water consumption by 9%, showing the Group’s determination to decouple growth from environmental impacts. In 2018, Carlsberg launched a series of consumer-facing sustainable innovations, including Snap Pack, which reduces both plastic waste and carbon emissions. A series of consumer-facing sustainable innovations launched, including recycled shrink wrap, the new Snap Pack, which reduces multipack plastic usage by up to 76%, and PU:REST – the first beer in Sweden made from recycled wastewater.